Hey Guys! Welcome you onboard. The above calculator is a swift Rankine to Celsius Converter. You can put any value in Rankine temperature scale and get Celsius value right away. The temperature converter gives you the flexibility to convert any value from one scale to another. If you aim to convert these values manually, you can use the conversion formula. Following formula is used for temperature conversion from the Rankine scale to Celsius scale. In words we can define, temperature value in Celsius scale is equal to the temperature value in Rankine scale minus 459.67 times 5/9. Convert 80 Rankine to Celsius scale. 80 Rankine in temperature scale is equal to the -228.70 in Celcius temperature. 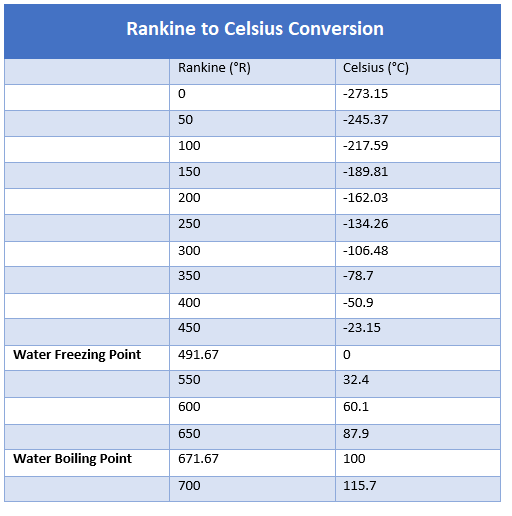 Following table shows some common values we mainly use for Rankine to Celsius Conversion. Rankine temperature is described as an absolute scale of thermodynamic temperature. William John Macquorn Rankine proposed this scale in 1859 that’s the reason it is called the Rankine Temperature Scale. Rankine scale is denoted by ºR and the zero in the Rankine scale is also equal to the zero in the Kelvin scale. This temperature scale is mainly used in engineering systems targeting heating commutations. It is important to note that both temperatures don’t share a common value and some offset of value -491.67 times 5/9 needs to be added to make them equal. Water freezing and a boiling point in both Rankine and Celsius Scales are 491.67 ºR or 0 ºC and 671.67 ºR or 100 ºC respectively. Most of the engineering and scientific fields around the world use Kelvin scale for thermodynamic temperature measurement while some engineering fields in the U.S. prefer the Rankine scale for measuring thermodynamic temperature. The Celsius can be defined in terms of Kelvin, where -273.15 Celsius equal to the 0 K – mainly known as the Absolute zero. The Celsius scale was named after Swedish Astronomer Anders Celsius. Until 1948, this scale was written as centigrade – A Latin word comes up with two parts where centum means 100 and gradus means steps. After that, this scale is commonly called as Celsius that is named after the Astronomer. Earlier, the Celsius was defined as per the freezing and boiling point of water where it freezes at 0 ºC and boils at 100 ºC. The temperature in Celsius scale plays a vital role in expressing temperature intervals including differences between temperatures or their uncertainties. That’s all for today. I hope you have found this quick read valuable. If you have any question, you can ask me in the comment section below. I’ll try my best to help you the best way I can. You are most welcome to keep us updated with your suggestions, they help provide you quality work as per your needs and requirements. Thanks for reading the article.